If you are looking for an awesome miniature dive light, this is it! 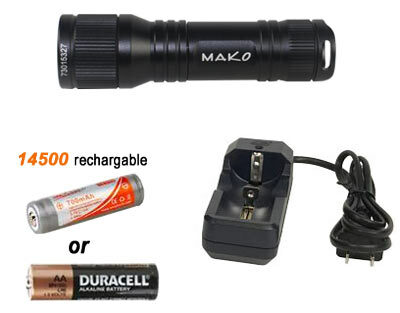 MAKO Spearguns has teamed up with the world’s dive light maker, OrcaTorch to offer this amazing dive light. Mounts to any speargun with MAKO flashlight mount! The MAKO Spearguns Mini 630 Lumens Dive light can also be mounted on your dive mask strap. 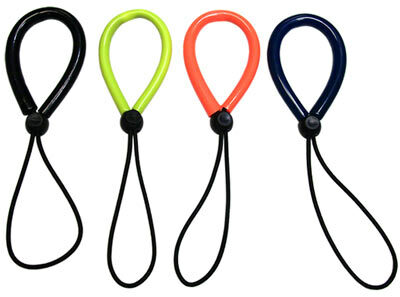 Works great for hands free operation in caves, holes or during night dives. The MAKO Spearguns Mini 630 Lumen Dive Light can also be mounted to your speargun using the optional MAKO Spearguns flashlight mounting kits which attach to any speargun. Just like the MAKO Spearguns Rapid On/Off Camera Mounting Brackets, the MAKO Spearguns Light Brackets are the most durable and most versatile brackets available. This is a fantastic light if your divng super short and quick, 2 hours or less. When your spending 2.5-3 hours diving for lobster like my friends and I, you really notice the dimming of the brightness. That being said, while the lights working strong, its fantastic, super sharp beam and really bright clean illumination. Thank you for sending the light and mount. I put it on my 70cm rail gun and its PERFECT. Like every idiot ever, the first thing I did was to test the brightness of the light. Surely something so small and powered buy a single, wimpy, double A could not be that powerful, so I looked directly into the lens as I turned on the light. Around the huge spots in my vision, I could faintly make out my wife with a disgusted look on her face, telling me how stupid I was. Blindingly bright, durable construction, nagging wife approved. The Dynema line is great and I used the little flashlight this weekend also performed to expectations. I do want to say that everyone that I turned onto MAKO has been satisfied especially with the customer service; you folks are second to none. I have been especially pleased with your wetsuits They are very well made and your prices are better than anyone else for the same high quality suits. Also a special thanks for your support of the military it is most appreciated. One last thing; can you folks please make a wishbone insertion tool a lot smaller than you currently have. The smaller diameter line such as the dynema the knot slides into the tool and therefore you cant release the knot when you try to pull it back out of the rubber tubing.